Winemaking in this area has a very long tradition and history: Trier as the closest bigger city is one of the oldest German cities – actually founded and developed by Romains during antic – the town always was one of the most important and influential seats of a catholic archbishop. Even today the area is still very catholic and some of the best vineries actually belong either directly to the archbishop or other institutions of the church. So it isn’t surprising that some of the hectares of Schwarzhofberg belong to the church. The wine is much too good to be used as communion wine and therefore it is wise to sell the wine: all churches probably have been always very successful in doing business. Look at this link if you like to see where Scharzhofberg is: http://www.riesling.de/de/lage/wiltinger-scharzhofberger/53_1459.html. Having a parcel of this hill Scharzhofberg could be compared with a lotto jackpot. Although other vineyards around Wiltingen aren’t bad at all, this is the one! There are six secular winemakers aside of church sharing less than 30 hectare vineyard. Among these you will find such famous and big name winemakers as Egon Müller, Weingut Reichsgraf von Kesselstatt and Weingut van Volxem. Today I like to lead the focus of one of perhaps less popular and but also great winemakers who is Johannes Peters. Although he is the lead of everything there is a family behind him: one other of so many family driven vineries. Most of his wines are rather made for daily consume, affordable but so terrible delicious that you can become addicted. 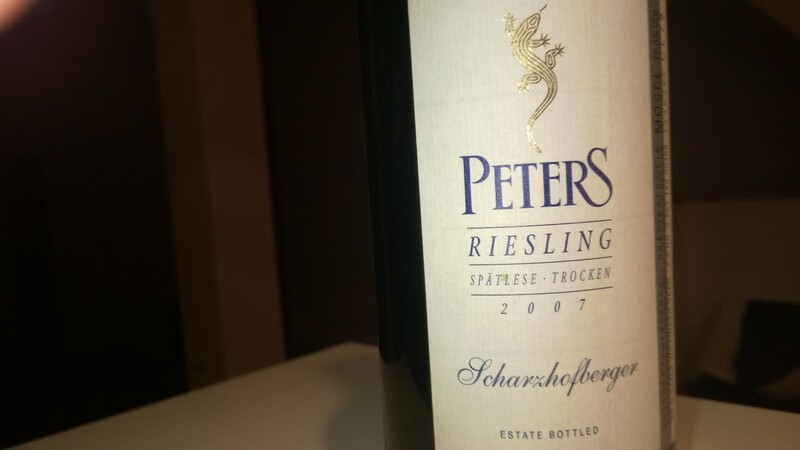 Of course like with other vineries as well: the Scharzhofer is Peters’s top wine athough he doesn’t qualify his one on a level of Großes Gewächs. It open recently Peters’s Scharzhofberger from 2007 which is exquisite. It delivers all that what you would expect from a great Riesling: minerality, fruitiness, petrol and freshness. It was rather surprising to me that the first approach of the wine has been rather modest and self depreciating which is a special experience since you would expect perhaps an immediate explosion of aromas. I like the straight forward and less ambitious balance of fruitiness and freshness on one side and minerality on the other side – which usually is a kind of character of wines of Peters. This one has a wonderful reverberation of its origin: you really taste soil. You perhaps can even taste the dynamic of Johannes Peters who is certainly not a quiet personality. Even it is a Spätlese there isn’t any strong sweetness, again it is rather a restrained wine. In very simple words: this is a straight forward Riesling of its best quality without any special treatment either at the vineyard or in the cellar. As much as Johannes Peters produces wine conventual as much honesty you can sip. Colourwise the wine looks wonderful, yellow golden with really a wonderful flavor. Due to its light patrol note and rich character this fine fits perfect to any Asian cuisine but of course also to any kind of heavier pork dish for instance. While I had the wine last time we had blood sausages of the Ötztal. This is heavily to top! Please find all further information about Peters at their webpage: http://www.peterswein.de/ (and make sure if you don’t like music on a webpage, switch off your loudspeakers! By the way: even I wrote “smaller” river at the beginning of my little review Saar isn’t an unimportant river at all. This water gives the name to one of German Bundesländer (Federal States) called Saarland where I lived arround seven years. The most confusing thing about so-called Saar wine is that the very shortest part – actually the estuary of Saar – lays in another Bundesland called Rheinland Pfalz. And if you would buy wine from Saarland, you would buy wine very probably from the Mosel as the river is the border between Luxembourg and Saarland. Isn’t this confusing? Yes it is! Typical Europe I would say, in particular to all my friend in US!